Print out labels for your RSVP cards and put them on the back of the card, or write numbers on the back. You WILL get RSVP cards back that do not have return address on envelopes and the stamp from the post office from where it shipped from will only go so far. Go to wedding expos! See what and who your choices are first hand and in person. Bridal shows give you a chance to see everyone in one place whether you are looking for one vendor or all of them, and you don’t have to drive all over town to find out they are what you are looking for. Hint: Take your fiancé! If he/she isn’t a part of the wedding planning, they sure will appreciate you after a bridal show experience! Please, oh please, don’t buy a dress that weighs more than you. I had a light strapless dress and the only thing I could think about 30 minutes until the end of the reception was taking it off! (And no, not only for that reason). You don’t realize how much a heavy dress can interrupt your night. 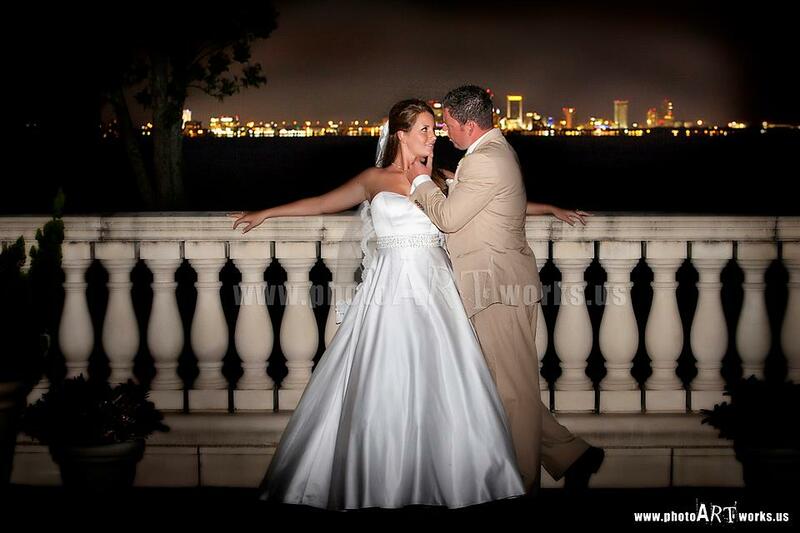 Do schedule a little nighttime photo shoot with your photographer. We did pictures around 10:00pm when everyone was comfortable on the dance floor. We snuck away and took some great shots, along with having a little breather and a few minutes of sweet alone time. If you choose to wear a veil, as much as you love that veil and won't have another opportunity to wear one, let me just share my experience before you make the decision to wear it the whole day. Everyone that hugs or dances with you will tug on the veil (without knowing, of course) and whatever style your hair was at the beginning of the day will look torn up! If I were to do it again, I’d take it of after dinner! Do a fake cake! The bottom layer of our 5-tier cake was the only part of the cake that was real so we could cut into it and get those priceless pictures of smashing it in each other's faces. The rest of our cake was in the kitchen already sliced and put out right after we cut into it. Instead of having waitstaff at your cake table for 30 minutes making a mess, it was already done. Make an email address only for wedding correspondence. I had (my name)2B(future last name) and it worked great! If you want to stay in contact with any of your wedding vendors after the big day, send an email to specific people politely asking them to update their address book. Do eat! My hubby and I didn’t make it around to everyone’s table. If that’s rude, we sure didn’t get any complaints. We noticed as we were eating, people came to us that were going to leave early or knew they weren’t going to run into us on the dance floor later. I worried up until a few weeks before the wedding about what “Our Song” was going to be. It's really easy getting frustrated finding a song if you don’t already have one when you’re listening to every word making sure its perfect. However, not you, your hubby, or your guests will hear every word like you did listening by yourself. My advise, pick a song that’s just special between the two of you. Do make sure your in-laws and parents have a speech planned. Our wedding was pretty traditional. The groom's parents threw the rehearsal dinner, where his parents said a little something, and my father had a toast at the wedding. I know it sounds very traditional, but it really sets the tone for two families becoming one. Everyone could feel the love our parents had for us and our new spouse with the words they spoke. Do you have any tips you'd like to share? Leave them in the comments below.